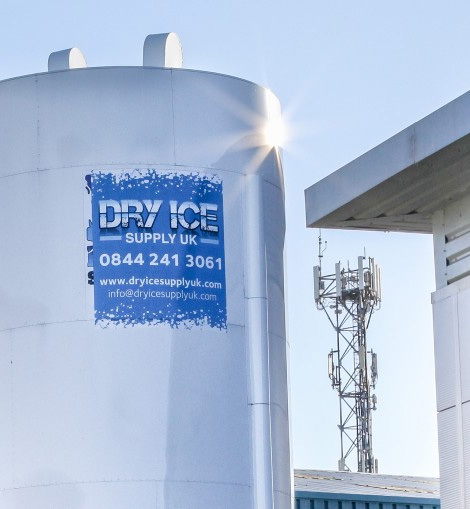 Dry Ice Supply UK are experts in the dry ice industry and we are able to offer cost effective, flexible delivery solutions as alternatives to more costly refrigeration in addition to always guaranteeing quick responses and reliability. We cater for a large range of companies across a variety of different industries, from Pharmaceutical to event management. Many companies only supply dry ice meaning that the dry ice is bought in and then supplied out. This means that the ice has been subliming over this period of time making it old by the time it is delivered to you and the weight inaccurate. This is what makes Dry Ice Supply UK your no.1 choice as we manufacture and supply dry ice fresh to you. We have a custom built facility giving us the ability to ensure that all dry ice produced on site is of the highest quality. This gives us the capability to supply our customers with the freshest dry ice possible with accurate weights in order to try and minimalize the sublimation that will occur as soon as the product is exposed to normal atmospheric pressures. 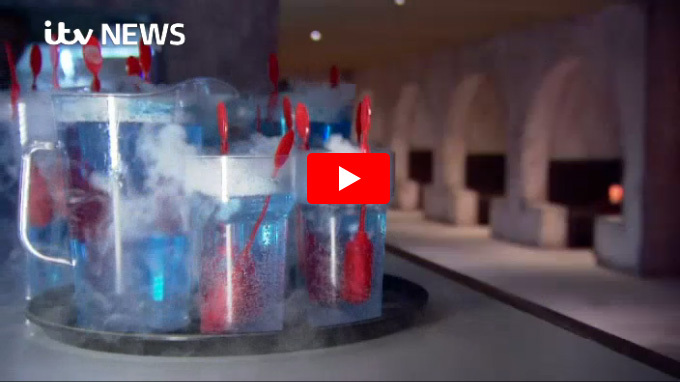 Catch our dry ice on ITV news? Our dry ice is being used in cocktails in the ‘Mos Eisley Cantina’ Tavern at the Love of The Force event taking place at the Bowlers Exhibition Centre. 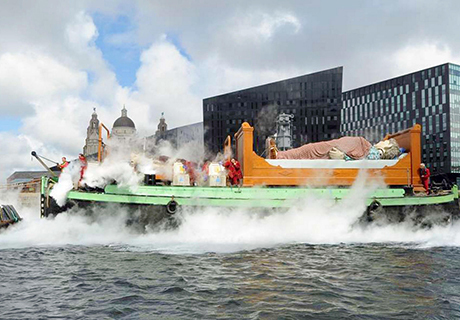 We are proud to have manufactured and supplied the dry ice used for the Liverpool Giants 3 day extravaganza. Prior to the show, the events organisers contacted us on the day of the rehearsals after being let down by their initial suppliers. We were happy to help and with a quick turn around and managed to supply the correct amount of ice requested. 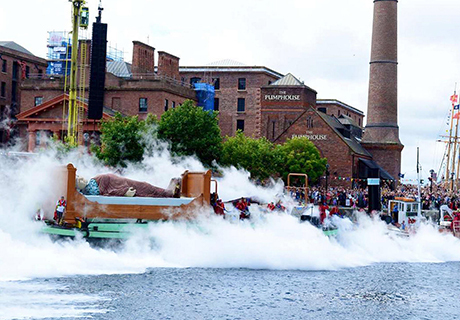 We later secured an order for 3 tonnes of dry ice to be used for the finale where a spectacular smoke effect was created upon the giants’ departure from the Liverpool Albert Docks. 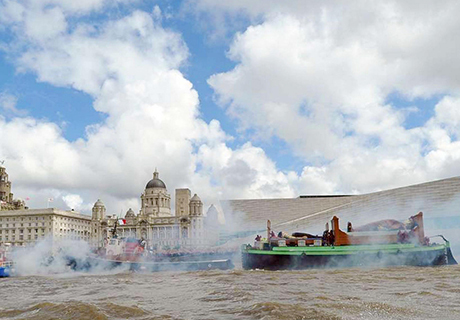 Dry Ice Supply UK was a key part of the giant’s grand departure from the Liverpool Albert Docks as they sailed away along the River Mersey out of sight. We worked closely with the events organisers and Liverpool City Council to make sure the order and service we provided was second to none. Thanks to our reliable service we were also asked to supply the dry ice for the next giant performance that took place in Limerick, Ireland. We were so pleased to have the opportunity to be involved in such an iconic and long awaited event and welcome many more opportunities like it. Occlusion, by artist Julieann O’Malley, is a durational performance installation, incorporating video work, soundscapes and photography that provokes questions and conversation about the real effects of the ‘invisible intruder’ – microscopic man-made pollution.